Asante Kotoko crashed out of the CAF Confederations Cup after losing 2-1 to Zesco United at Levy Mwanawasa Stadium in Ndola on Sunday. The Zambian side dominated the first half with several fearsome strikes but failed to register the opener as it ended in a scoreless draw. Stephen Nyarko came off the bench to put the Porcupine Warriors ahead at the start of the second half. But the hosts drew level in the 53rd minute through Jesse Were who capitalized on some dreadful defending by the Kotoko backline to tap in from close range. The Zambians dealt the final blow few minutes later, Kondwani Mtonga latched unto a loose ball grab the match-winner after goalkeeper Felix Annan failed to properly deal with a free kick. The result meant that, Sudanese giants Al Hilal and Nkana FC of Zambia have progressed to the next round of the competition with eleven points and eight points to sit on top of Group C and finish second. 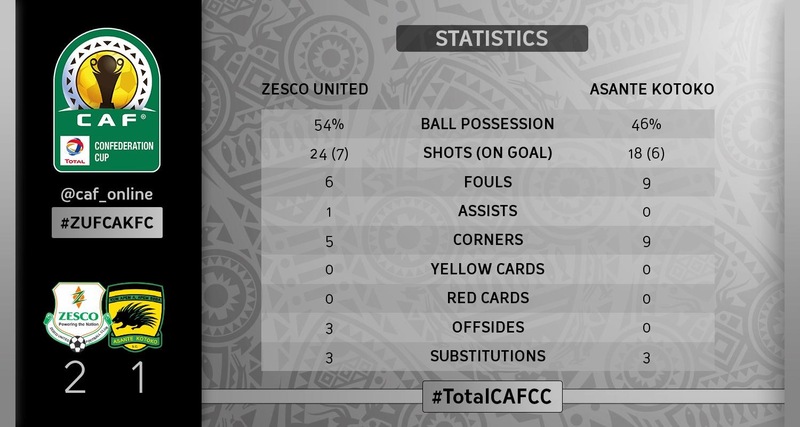 Asante Kotoko and Zesco United occupying the third and fourth position respectively.